Last of the Chester Subdivision was removed a number of months ago. Few years back HRM stood by while a fair bit of the Bedford Subdivision single tracked down from double. Has HRM missed the boat? With a downtown core that is a peninsula, isn't a more efficient mode of moving people to the core needed? And HRM continues to miss the boat. In fact HRM has a nice little information piece on the Metro Transit website that basically says rail transit is not at all feasable for HRM and to basically stop talking about it. The HRM transit planners seem to be anti-rail, which is a huge shame because this is something they should have been working towards years ago, so that when the day comes we're not trying to play catch-up. I'm in Halifax for the first time in 9 months and it's clear Metro Transit is already too far behind to bother playing catch-up. Running the Portland Hills Link at 60 minute frequencies off-peak will just push people onto conventional buses and give management a reason to cut off-peak Link service for good. Things seem to be going backwards on Ilsley. Now if they looked at Calgary's BRT setup, they'd understand that you don't need super-fancy buses but instead sell the route on "fast" travel time. And like Calgary, lose the premium fare and charge the same as regular routes. I'm looking over the route changes that recently took effect and what I see are far too many cuts to routes where the average income is less per household, ie. 51 & 53 and very little increases to exisiting areas where additional routes and re-routing of others are urgently required. I'd be happy to live in downtown Dartmouth and take an early morning job in B'side but the 52 can't quite get me there for 6:30am on weekdays. Management makes it quite obvious they, for the most part, aren't transit users. And what about service out #7 to Musquodoboit Harbour?? The demand is there, consultants gave a viable plan and city hall doesn't get buses out there. The reason why you see cuts in on these routes is two fold one is money ( ya I know Duh lol). Second is that every year they hire load counters to work on the routes from their numbers is where they get a lot of the increase and decrease plans. While some maybe less the 10% care about what they have been asked to do and employed to do. Most do not give a care, I have had some on my routes who just write down whatever they want and mostly play on their cell phones, so fudging data. This has been reported by drivers to management with no response but to hire the same people back next year. Also they have a habit of hiring some people that have been banned for a 3 or 6 month period from transit property and have just finished their ban. Thanks Chris, layoffs came without advance warning. Just pulled out of camp when my supervisor called me and a dozen or so other guys - "don't bother running today, we're done.... NOW". So now I'm in a great debating mood thanks to the ex-employer disqualifying me from getting the $1700 several cheque, just because I'm 4 or 5 days short according to the rules in the AB labour laws. Public humiliation for the company and upper management is my next course of action But I'm just relaxing in a Dartmouth hotel for another 4 nights before heading to NB for the holidays. calamin - Sounds like those load counters would make great candidates for key management positions on Ilsley, ie. totally out of touch with the world outside. I was on one of the Fast Ferry test runs back in 2005, and it took about 15 minutes, if I recall. If you were standing outside the cabin, you didn't want to wear a hat, that's for sure! Of course, that's not factoring in any docking and loading times, but I still think the fast ferry idea is more feasible and realistic than commuter rail at this point. Would commuter rail be doable if MT's planners had more vision? Probably. So if we upgrade the old DAR, and run an RDC in from Middle Sackville, then add the double track back as far as the Hammonds Plains Rd at the Sobeys, you could run the Ferry from there. I bet you could beat the the car time from the same location with a combo of rail and ferry. Have a dedicated bus run in Hammonds Plains rd to the same Ferry terminal and maximize the potential. This is assuming you can't get CN to play ball on running over their trackage. If you can work with them, then it gets even easier. What's HRM's forcast for the next 10-20 years in terms of $$ to be spent on more roads or upgrading of roads to handle increased traffic flow from Sprawl? The municipality is seeking a consultant to research the public transit option to determine if it would be possible. A proposal request for a feasibility study was issued this week; the deadline for bids is May 23. Would have been nice if they'd worked on this before CN tore up the second tracks. It will be just like VIA's problem when commuters are late or don't get home at all because CN trains will have priority when it comes to track sharing or when an incident shuts down the section of rail. Maybe HRM could look at running commuter coaches instead. I bet the many millions of dollars needed to set up commuter rail would go a long way when it comes to buying 45-foot commuter coaches, building a storage/repair facility and staffing the operation. It found that on a Halifax-to-Cobequid route, the service would have 3,049 passengers daily and would cost almost $10 million in annual operating costs. Halifax Transit's eight express routes that run to downtown Halifax cost about $2.3 million to operate and carry 3,608 passengers each day. Coun. Barry Dalrymple (Waverley-Fall River-Musquodoboit Valley) said the commuter rail study was tremendously positive. This was unexpected.. and with Via Rail proposing it, this might actually go somewhere! There's no estimate as to how much the latest proposal could cost the municipality. The corporation declined an interview Monday, with a spokesperson saying by email it's looking to "assist and support" Halifax in offering commuter rail. [transportation committee member Coun. Tim] Outhit said he's heard from Via Rail the corporation could have it up and running within a year after negotiations are completed. I suppose Via would be expecting some sort of financial partnership with Halifax. Arrangements for some degree of fare integration would be a very useful step too. I hope VIA can get this up and running without interference from the ATU and local pres. Ken Wilson. I'm typically pro-union but Ken was on the news tonight whining about how the train might compete with Halifax Transit bus routes. Rail transportation isn't covered under municipal or provincial regulations, its covered under federal law. If VIA wants to run trains on tracks that its has users rights for then Ken and his crew should stop complaining and maybe take a look at how the municipality and his members can step up their game once the VIA-operated trains gain a reputation for efficiency, timely service (ie. on-time, not standing outside the bus having a smoke 5 minutes past departure time) and friendly customer service. Halifax (train station), South End (looks like around Beaufort Ave and South St), West End (West End Mall), Rockingham, Mill Cove, Sunnyside, Bedford Commons (Rocky Lake), Cobequid. As well, new passing sidings near Rocky Lake, just before Cobequid Road, and in the rail cut. Presumably these sidings would house the stations at those locations. 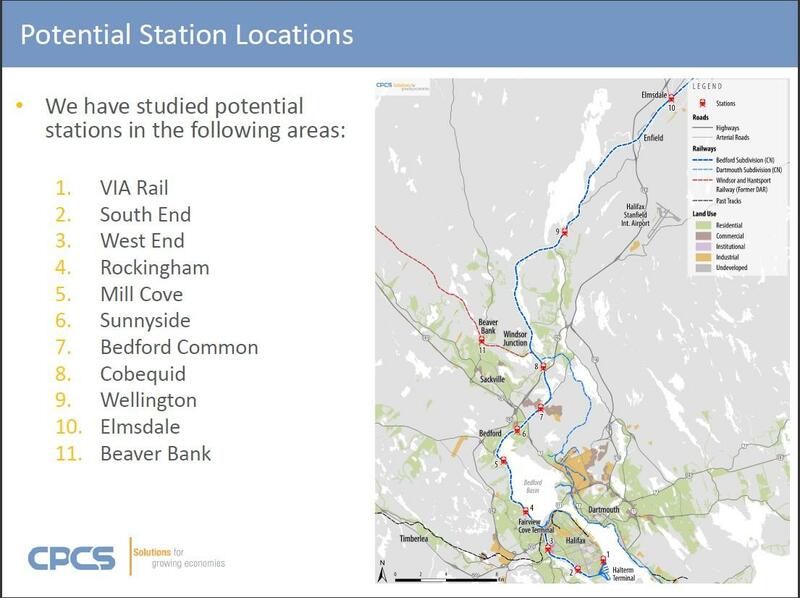 The 2015 report also talked about the possibility of extending service to either Elmsdale or Beaver Bank (or both). Beaver Bank would have little issues with regards to rail capacity, as the Windsor Hantsport Railway is not used. However the rail is in poor condition, and would need significant work to bring it up to standards. The issue identified in the report with service beyond Windsor Junction to Elmsdale is entirely scheduling and capacity, with the increased rail traffic coming off of the Dartmouth sub. As indicated in the report, there are daily freight runs from Dartmouth to Moncton heading out in the middle of the morning rush hour service. What should be interesting is to see what sort of rolling stock Via is going to propose. I can't honestly see them using the old Budd RDCs, I believe a lot of them were cut up for scrap a year or two ago. Should be interesting to see if they're proposing a traditional locomotive-pulled train, or perhaps something like the new DMUs being used by the Union-Pearson Express in Toronto could be interesting. I'm also interested to see what they come up with for park and ride service; Bedford Commons and Cobequid should have plenty of room, Sunnyside might be a bit difficult as it's fairly built-up behind the mall there. Not sure if they would put one in at Mill Cove. The other stations would not warrant park and ride as they would mostly feed destinations or passengers from transit. I'd be very surprised if Via was thinking of new rolling stock. The short timeline suggests to me they are thinking of existing, underutilized equipment. Two or three RDC's, as elderly as they are, would be my guess. Two or three sets of a locomotive and a couple of coaches would also work but wouldn't that require more staff? Can a one-RDC train be operated by one staff person? On Tuesday night, council voted to direct staff to begin negotiations with Via Rail for a commuter rail service between Windsor Junction and downtown Halifax. On Tuesday night, Halifax regional council voted unanimously to direct staff to begin negotiations with Via Rail for a commuter rail service between Windsor Junction and downtown Halifax. [...] if an agreement can be found between the two parties, a service could be on the rails within a year. How far east would this commuter rail go? What rolling stock is most likely to be used? I was think HEP2s and F40s is possible, maybe RDCs. This map is from the study that was completed in the last year. The Via proposal currently being investigated covers stations 1 through 8 only. Stations 9 and 10 would require improvements (probably some double tracking) to accommodate commuter trains because of heavy freight traffic. The track leading from station 8 to station 11 is currently out of service and would require substantial rehabilitation.